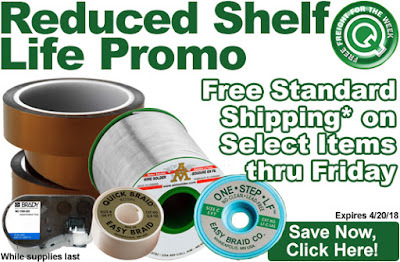 This week’s promo gets you Free Standard Shipping* on select Reduced Shelf Life products at QSource.com. To take advantage of this discount, just add an eligible item to your shopping cart. Offer is valid Monday, April 16, 2018, through Friday, April 20, 2018. * Free standard shipping in the contiguous United States. Our limited-time offer includes items like Easy Braid Desoldering Braid, Argon Masking Polyimide Kapton Tape, AIM Solder SAC305 Solder Wire Spool, and more. Visit our Reduced Shelf Life promo page for a chart of remaining shelf life percentage on eligible items. Click here to purchase an eligible reduced shelf life product. For further questions, call us (800-966-6020), or send us an email. Please note: This promo is valid only at QSource.com.